Homo Riot is activism just the way we like it: brash, crass and out in public. Consider this the writing on the wall. Homo Riot is a one-man street art operation based in Los Angeles. He started papering the city's walls back in 2008, after Prop 8 had passed and LGBT people across the country were up at arms. Like most street artists, he works at night, using stencils, graffiti, posters and glue to spread an emphatic, usually graphic message to homophobes everywhere: we aren't going to take this lying down. In September, the artist organized Global Homo Riot, where fans the world over brought his designs to their own cities. 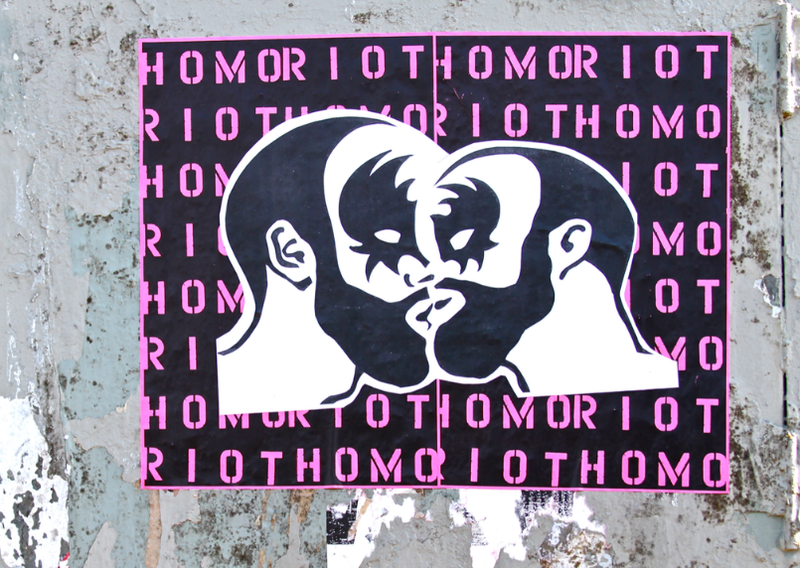 On the Homo Riot blog, you can see photos of his images spray-painted and pasted in New York and Paris. The artist plans on compiling the best images for a gallery show in 2012, but if you happen to live in the Los Angeles area, you don't have to wait that long to see his work on exhibit. Hold Up Art is currently showing "Fist Pump," a collection of Homo Riot's work that moves beyond street art and includes photography, decoupage and objet d'art. If you have the chance, visit the gallery and take a look - the show runs through November 18. If you can't make it, maybe you'll see his work at a bus stop near you sometime soon.